TiAdvisor (Tool Inventory Advisor) is a new feature under development within HSMAdvisor. Unlike most cases when developers design a standalone product and then go through a laborious work of integrating it into existing software products, i decided to go the other way. TiAdvisor will be developed as an integral part of HSMAdvisor and then, once complete, will be moved into a separate standalone product. This will make for seamless integration between our software products. Keeps track of inventory levels. More functions are being worked on. After you enter the number of tools, please click "Create Purchase Request Form" button. It will take you to a form that will let you specify details about the request you are making. To Finalize your Request and set those tool items into "Waiting for Delivery" mode click "Save Request" button. You can Now close the window by pressing Cancel button. 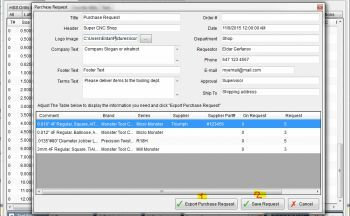 When Any or All of the tools are received you should enter the received amount into "Received" column and then to finalize the operation click "Apply Received to stock". This will add the Received amount to the stock and subrtract from the "On Request" amount.